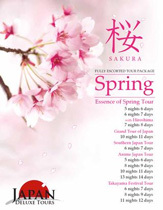 Japan Deluxe Tours should offer return guests discount on trip. Groups should be kept to around 20. Headsets should be used and upgraded. Often too soft to hear well. The tour guides were incredible and really made the Japan tour even more wonderful Generally very positive impression. Would use Japan Deluxe Tours again. Good pace, did a lot of activities in short period but not rushed. Would also enjoy a few shopping - not souvenir shop, but in real (high quality) shopping area. Great locations. Good mix of western and Japanese. Efficient and cordial. Good to have WIFI. Good breakfast. Too much fried. Shabu Shabu great. We were asked before departure if we liked raw fish. Said no - but no accommodation meal. We sew all same food as others. Japan Deluxe Tours includes most of good meals. Too hard to manage on our own. Guide Seiko was very helpful at dinner on our own in Kyoto Gion finding restaurant. Some food were very repetitive. Tour guide Hide-san was very organized and helpful. Lots of information of historical and cultural. Great group size (18), really fun. Guide Seiko was extremely helpful and informative, sweet. Both gave us wonderful impression of Japan and Japan Deluxe Tours. Cherry Blossoms phenomenal loved southern Japan loop. Great mix of temples, shrines, hot springs, peace park, bath houses etc. Garden and flowers are terrific. Osaka - Kyoto - Tokyo - Hakone Ropeway. Disappointing. Not fault of tour, just not enjoyable. All small-group journeys are guaranteed to operate with just 6 guests. Call for preferred rates through our partner.